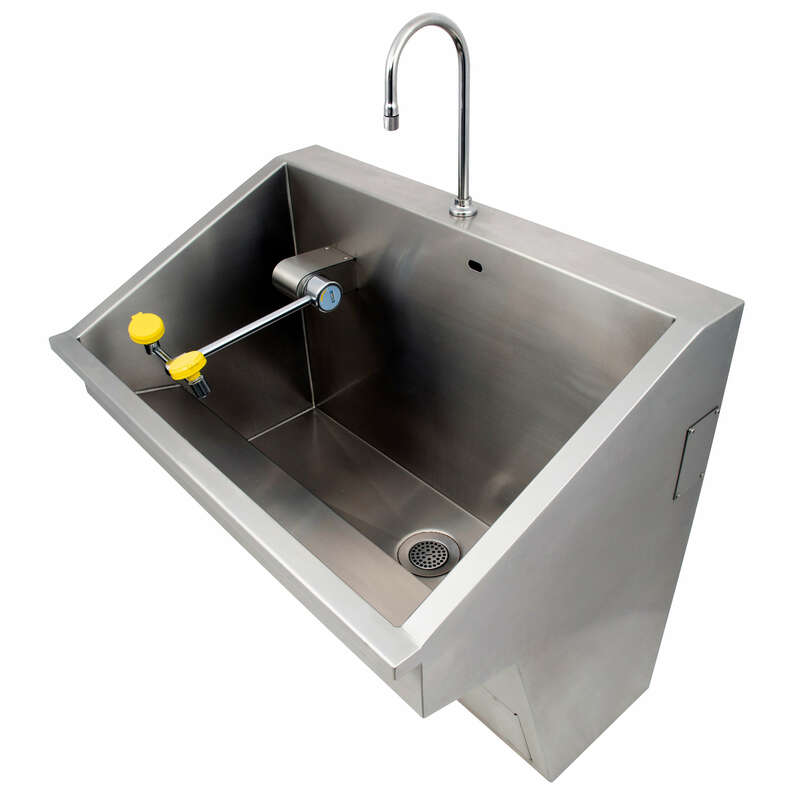 16 gage 304 Stainless Steel ADA Compact Scrub Sink with removable gooseneck spout assembly spray head(s). Sink has a 1-1/2" outside dimension tail piece with a 3" flat strainer drain. Includes removable front access panel, thermostatic mixing valve, and hands free sensor operation. 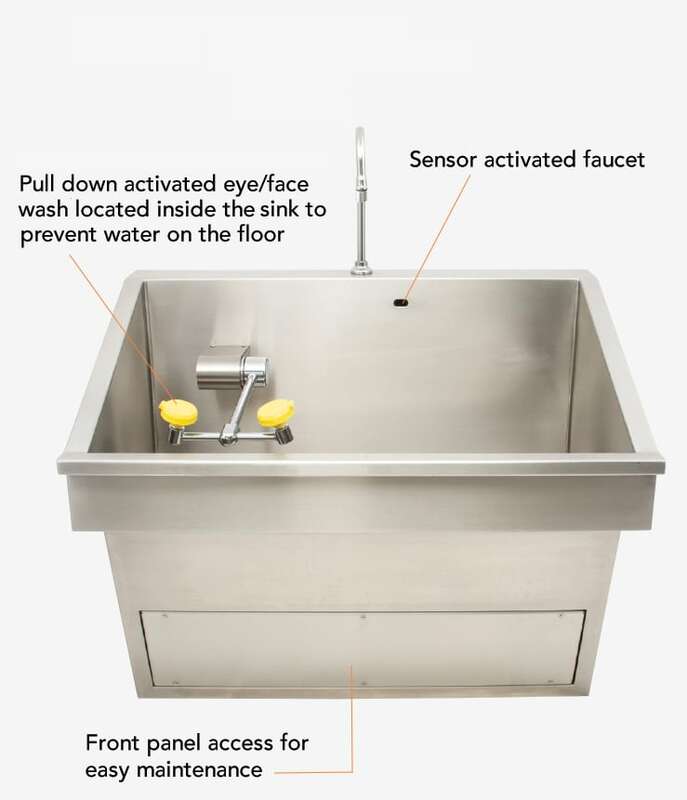 Sink complies with ADA requirements. This is a one-station unit measuring 36" wide. 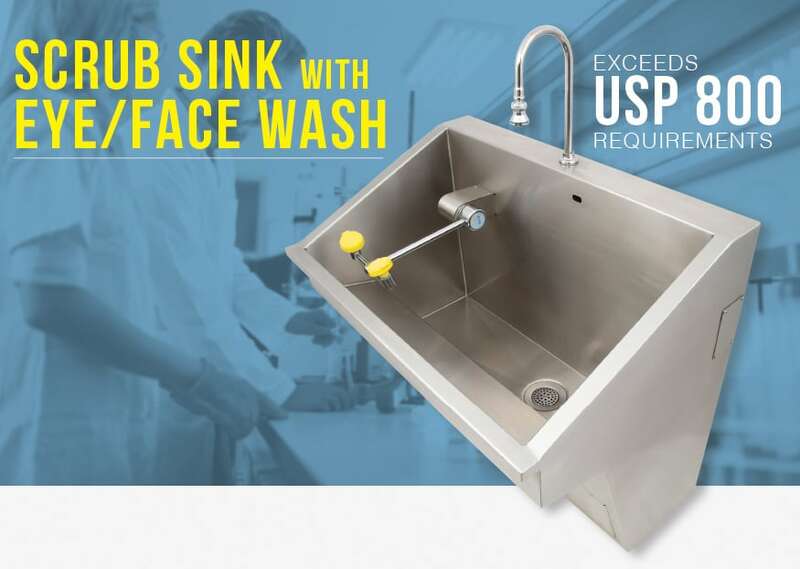 The scrub sink is compact in size 36 x 23.875 x 32.25 (914 x 606 x 819 mm); it is ideal for small clinics or pharmaceutical facilities. The model # 4121ADA-EFW-LFN also doubles as an eye-face wash station meeting occupation safety regulation including OSHA. The profile view of the sink is designed compliant to ADA regulations. Compliance is subject to proper mounting, the interpretation and requirements of the local code authority. The unit is manufactured from heavy gage, type 304 stainless steel and is seamless welded construction with a satin finish. The Cabinet interior is sound-deadened with a fire-resistant material. Sensor activated gooseneck faucet is mounted on the backrim of the sink. The sensor is connected to a solenoid valve which is a slow-closing, anti-water hammer type. A laminar flow nozzle (-LFN) is provided for the faucet. Temperature/Pressure Balancing Mixing Valve is located behind the Front Panel and maintains a constant water temperature. This easily adjustable, anti-scald Valve compensates for inlet temperature fluctuation. A swing-down eye-face wash is included turning on when the eye-face wash is dropped from a vertical to horizontal position. The eye-face wash requires a separate ASSE 1071 complaint mixing valve. It is supplied with this fixture.